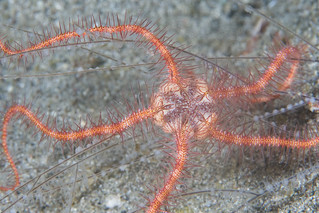 The Echinoblog: BRITTLE STARS! COLOR EXPLOSION! A big heads up thanks to Wild Singapore who took these lovely images! This week is busy for travel, etc.. So what do you get? yes! 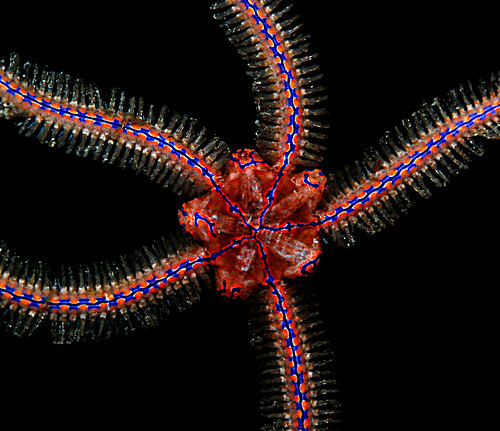 Its time for BRITTLE STAR COLOR EXPLOSION! Let's start out with some Arthur Anker goodness! 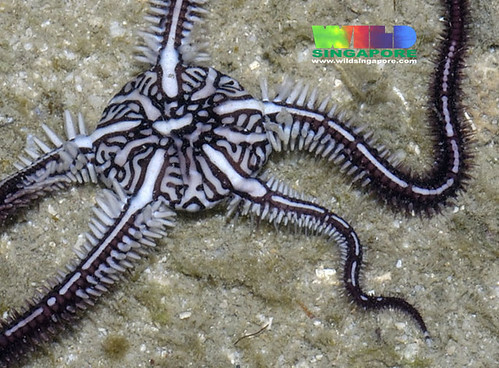 From Wild Singapore (and Rita Tan)! 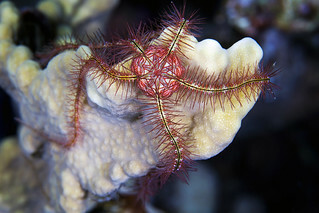 The commensal brittle star Ophiomaza cacaotica! More on the biology here. 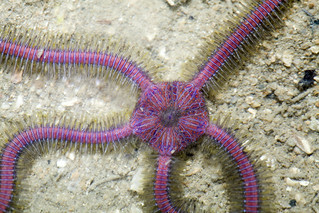 It lives commensally on ANOTHER echinoderm! 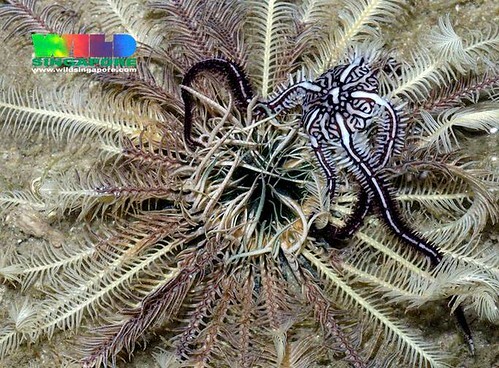 Feather stars! 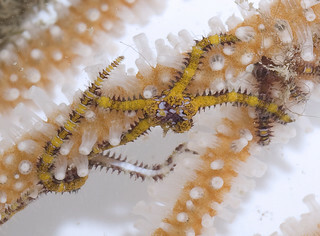 Various shots of Ophiothela danae, a small brittle star that lives wrapped around gorgonian branches..
Why are Echinoderms only found in marine ecosystems? Are they just their by chance? Or is their something about their biology or the function of the water vascular system that needs salt to function? 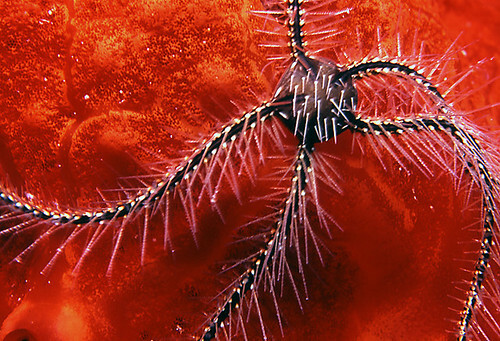 It is believed that echinoderms have never entered non-marine systems largely due to the nature of their osmoregulatory systems. That is, their ability to filter or process the chemical imbalances in fresh vs. marine water. There are things such as salts, ions, etc. which occur more readily in the ocean than in lakes, or etc. 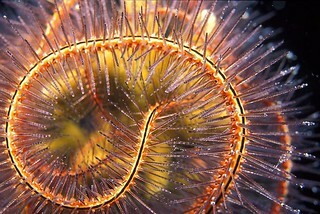 the other animals which do live in lakes, ponds or on freshwater such as crustaceans, mollusks, etc. all have some kind of filtration system that permits them to tolerate the change in setting. but truth be told, this is largely inference and speculation. It would be a difficult to question to answer in a strict sense. 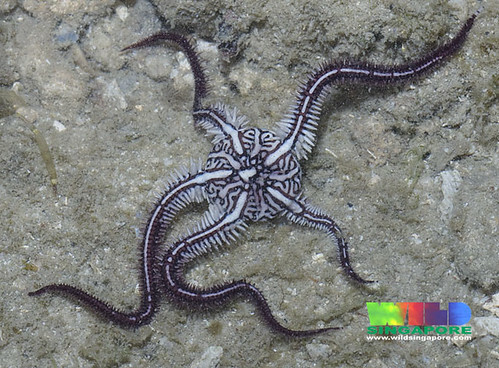 But limitations of the filtration system would make sense given how closely tied (and how successful) echinoderms are in marine environments. Can I make a request? 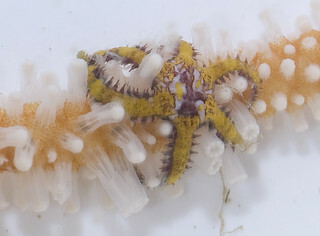 The other day I was talking about echinoderms and sea cucumbers and my mother was surprised that sea cucumbers are echinoderms since she doesn't think of them as having "spiny skin'. 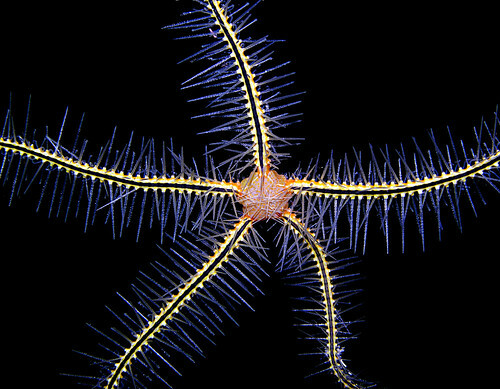 I can explain the general 5 part body shape, but I realized I don't actually know how the rest of the anatomy correlates to more typical echinoderms like starfish and urchins (ie tube feet, organs, jaws etc). I'd love to learn more about how parts have adapted in cucumbers, and more about where the "skeleton" went in the fleshier ones if you happen to have interest in posting something on it :) Thanks again for the great blog! Certainly! That's a meaty subject.. but a good one! I will write it! But let me see when time will permit the full treatment!